King Tutankhamun hunting, King Tut hunting, tut hunting, king tut. Egyptian Museum, Cairo Dynasty XVIII, 1347-1337 B.C. 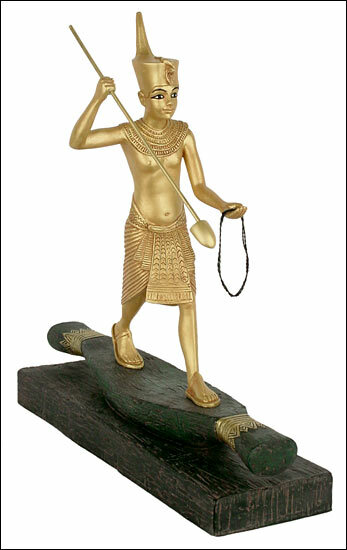 This is one of the 32 statuettes found in the tomb of Tutankhamun. Carved out of wood, stuccoed and gilded, it shows the king with a harpoon standing on a papyrus boat. Wearing the crown with Uraeus at his brow, a wesekh collar, short pleated kilt with ornamented frontal tab and sandals, the king is frozen in action just as he is about to hurl his harpoon into the flesh of an invisible enemy. His pose is an exceptional occurrence in the history of a royal statuary which has never been anything but static. The hunt in the marshes is a theme that concerns the triumph over evil, personified in this case by the hippopotamus in the swamp. The victorious king defeats the forces of chaos and preserves the universal order which is his duty to insure. Seth, the god that represents the forces of chaos and destruction is here symbolized by a red hippopotamus being finally vanquished by the king.